SOS Gases offers Acetylene, Argon, Carbon Dioxide, Helium, Hydrogen, Nitrogen, Oxygen and Propane. With SOS, you can rely on our gases to be of the highest quality, purity and integrity to help you conduct accurate experiments. We are a complete distributor and carry, service and repair a full line of welding equipment and welding systems. Please contact our friendly and professional team to answer any questions you may have about our services. We offer the best products and our team is dedicated to excellent customer service. Over the years, SOS Gases, Inc., has built up a reputation with our customers due to our excellent delivery service and personalized customer relationships. Our Kearny, NJ, location will be pleased to assist you in any way we can. 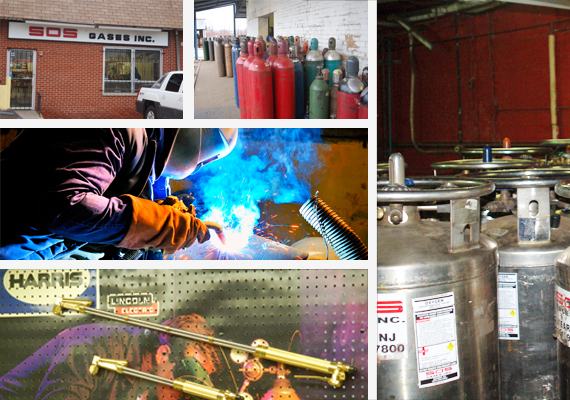 SOS Gases, Inc., has been in business for 50 plus years in the Industrial and Specialty gas industry. We are a complete gas distributor for the construction, manufacturing, energy, chemical, electronic, glass/ceramics, healthcare, food and beverage industries. Our delivery fleet consists of seven cylinder trucks, two liquid transports, and 32 tube trailers and three jumbo tube trailers. SOS Gases, Inc., has one of the largest tube trailer fleets in the tri-state area. We also install complete bulk liquid systems to fit your requirements.. Thank you for visiting SOS Gases, Inc. Please explore our new website and feel free to contact us.